Click Here - To see how Mecklenburg County evolved each decade - includes all the known towns and villages. Click Here - To view the significant Education events for Mecklenburg County since the county was formed. Click Here - To see the known battles/skirmishes in Mecklenburg County during the American Revolution. Click Here to go to the official website of the Mecklenburg County government. Click Here to learn more about the known airports in Mecklenburg County. The county was named for Princess Sophia Charlotte of Mecklenburg-Strelitz, the Queen of King George III. The first settlers came to the area in the late 1740s from Pennsylvania, Maryland, and Delaware. They, like the explorers and traders before them, found Catawba Indian villages scattered throughout the territory. The Catawbas were a peaceful, relatively civilized people and presented no threats to early settlements. Increasing numbers of settlers were attracted to the area, and on December 11, 1762, the colonial General Assembly creating Mecklenburg County granted a petition from a portion of Anson County, to be effective on February 1, 1763. Settlers chose the name Mecklenburg" for their county in hopes of gaining favor with King George III of England whose wife, Queen Charlotte, was born in the German province of that name. The original county of Mecklenburg was considerably larger than it is today. It included portions of what are now Cabarrus, Union, Lincoln, Rutherford, Cleveland, and Gaston counties. Upper portions of South Carolina were also once in Mecklenburg County. After the creation of the new county, there was vigorous competition between the residents of the eastern Rocky River area and those who lived in the community of Charlottesburgh or Charlottetown over the location of the county seat. To enhance their cause, leaders of Charlottetown on their own built a log court house in 1766 at what is now the intersection of Trade and Tryon streets. Their effort paid off, for on December 3, 1768, the town of Charlotte, named again after the Queen, was incorporated and temporarily chosen as the county seat, a designation that became permanent in 1774. By the mid-l770s, strong resentment against government by the English had developed in Mecklenburg. To decide what course of action should be taken, Mecklenburg leaders from each militia district gathered at the county court house. On May 20, 1775, the Mecklenburg Declaration of Independence, a brief document formally renouncing the countys ties with England, was signed and proclaimed to the populace from the court house steps - more than a year before the American Declaration of Independence was signed. Several days later on May 31, the 1eaders re-assembled and adopted the Mecklenburg Resolves, which outlined a new system of government for the county. Others considered the Mecklenburgers actions premature in the province that still hoped for compromise with England, so the plans for a new government were never implemented. But compromise proved to be impossible. On July 4, 1776, the Declaration of Independence was signed and the American Revolution was "officially" under way. Mecklenburgers were ardent supporters of the Revolution. Some spent the bitter winter of 1777-78 at Valley Forge. When the British Lt. General Charles, Lord Cornwallis invaded Charlotte on September 26, 1780, he encountered stubborn resistance from the Patriots. The rebellious Mecklenburgers made his occupation of the town a miserable experience. The local militia harassed his troops in their search for food, intercepted his messengers, and hampered his communication with other allied forces. 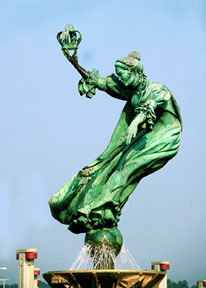 Lord Cornwallis referred to Charlotte as a hornet's nest, " a nickname that has lasted through the years. Click Here to learn about all of the known officers and men who served in the Mecklenburg County Regiment of Militia during the American Revolution. All names in "blue/underscore" can be clicked on for additional information. The end of the Revolution meant Mecklenburgers could turn their interests to their community and from 1781 to 1800 a period of rebuilding and growth took place. Several stores, a flour mill, and a sawmill were opened. In 1792, a post office was established in Charlotte and by 1794 there was stagecoach service. A major event of this period was President George Washington's visit to the county in 1791. In the years to come two Presidents, Andrew Jackson, born in 1767, and James K. Polk, born in 1795, were native Mecklenburgers. The discovery of gold in Mecklenburg County in 1799 marked a turning point in the county's development. Hundreds of miners, engineers, and fortune hunters poured into the area. Mecklenburg became the gold capital of the United States, and in 1837 the first branch of the U.S. Mint was opened in Charlotte. The mint ceased operation during the War Between the States, but the building was used for various federal operations until the 1930s when it was moved from west Trade Street to its present location on Randolph Road and opened as the Mint Museum of Art. The antebellum days were indeed prosperous times in Mecklenburg County with gold mining, successful cotton plantations, and growth of the county as a business center. The invention of the cotton gin made cultivation profitable, and Mecklenburg is said to have ginned more cotton than any other North Carolina county in this period. In 1810, the county's first brick court house was built, but it had to be replaced by a larger two-story model in 1845. A public school system consisting of one-room school houses throughout the county was established in 1841 after a favorable vote to levy a tax for that purpose. In the 1850s, two railroads to Charlotte were opened - one from Columbia and one from Greensboro - and the telegraph was introduced to the county. Although there was little fighting in Mecklenburg during the American Civil War, the county was an important part of the Confederacy. In 1861, the U.S. Mint was seized and converted into Confederate headquarters for the area. The next year the Confederate Naval ordnance was moved to Charlotte because the Norfolk area was threatened by Union troops. Naval weapons and munitions were made at the facility until late 1864 when it was destroyed by fire. In 1865, records of the State Department of the Confederacy and the Great Seal were stored in the Mecklenburg County Court House and that same year the last full meeting of the Confederate Cabinet took place in Charlotte. Union troops occupied Charlotte in June of 1865 and did not completely withdraw until 1872. Reconstruction times were hard, but as they had after the Revolution, Mecklenburgers began rebuilding their lives and their community. Gold mines were re-opened on a limited basis and new stores and shops established. Although Meckienburg County would never again be a major producer of cotton, the county became a processing center and at one point had seventeen cotton mills within its boundaries. Charlotte emerged as an important transportation and distribution center because of its railways and systems of roads. Community development accelerated in other areas too. By 1880, there was a private hospital in Charlotte and the beginnings of a public health service were in evidence by the late 1890s. What was to become the public library was started and a graded public school opened in Charlotte. Communications improved with the appearance of several newspapers, telephones, and electricity. The towns of Cornelius, Davidson, Huntersville, Matthews, and Pineville were also established during this period. In 1900, Mecklenburg County had a population of 55,268 and life was leisurely. But, with the beginning of World War I the pace of both life and population growth quickened. Camp Greene, an Army training camp, was established west of Charlotte and recruits from across the country poured into Mecklenburg County. Many of the so1diers later returned to make the county their home. A period of general expansion followed the war, and by 1930 Mecklenburg's population was more than double the count at the turn of the century. Although the Depression of the 1930s brought economic hardship, steady growth continued and by 1940 the county population had increased to 127,971. World War II again made Mecklenburg County a military center. In 1941, Morris Field Air Base was built around Charlotte's Douglas Municipal Airport and served as a training center. A giant Quartermaster depot was opened on Statesville Road and a large naval munitions plant was constructed on York Road. Although the war dominated the decade, other significant events took place in the 1940s: Charlotte Memorial Hospital, the first public general hospital in the county, was opened in 1941. Charlotte College, the forerunner of the University of North Carolina at Charlotte, was established in 1946. The decade of the 1950s was a period of exceptional growth. New homes and shopping centers were built to accommodate the increasing number of people attracted to the area. Industry and business also expanded, bringing more jobs to the community. New facilities were built to keep pace with the growing population: Douglas Municipal Airport was expanded (1954); Ovens Auditorium and the Coliseum were opened (1955); a new Public Library was dedicated (1956); a new Health Department was built (1959); and construction was started on the County Office Building (1959). Another significant event of the decade was voter approval of consolidation of city and county school systems in 1959. By 1960, more than one-quarter of a million people (272,111) lived in Mecklenburg County. Educational facilities were greatly expanded through the establishment of Central Piedmont Community College (1963) and the University of North Carolina at Charlotte (1965). Growth in the business sector of the community was impressive, with more than 500 new firms locating in Mecklenburg County and creating some 70,000 new jobs. During this decade, Lake Norman was also built, and the beginnings of the Governmental Plaza were seen with the completion of the Education Center and the Law Enforcement Center in 1969. The census count in 1970 again reflected Mecklenburgs expansion -- a total of 354,656 people lived in the county. With the increased urbanization of the county, an effort was made to consolidate the governments of the City of Charlotte and Mecklenburg County. Voters, however, defeated the consolidation proposal by a 2-1 margin in a referendum held March 22, 1971. City-County cooperation, under way long before formal consolidation was proposed, has continued in an effort to avoid duplication of services. Approximately a dozen govemmental operations, including water-sewer service, tax collection, and purchasing have been merged through the years. As Mecklenburg County moves into the new millennium, the outlook for continued growth and prosperity is excellent. Mecklenburg is the center of a six-county Metropolitan Statistical Area (MSA), which includes more than 1.4 million people. In addition to Mecklenburg, the counties are Gaston, Union, Cabarrus, and Anson Counties in North Carolina and York County, South Carolina. Development is taking place in all areas of the county and in a variety of forms. Growth, however, is not taking place haphazardly. Steps are being taken to see that development occurs in a manner that will enhance rather than detract from the community. The environment is being safeguarded; land use is being planned; and attention is being given to improving the quality of life. All this is being done so that Mecklenburg will continue to be an exciting, quality-orientated place to live. Click Here to view / download an Adobe PDF file of the book, entitled "The History of Mecklenburg County from 1740 to 1900," by J.B. Alexander, M.D., published in 1902. Click Here to view / download an Adobe PDF file of the book, entitled "History of Mecklenburg County and the City of Charlotte from 1740 to 1903, Volume I," by D.A. Tompkins, published in 1903. Click Here to view / download an Adobe PDF file of the book, entitled "History of Mecklenburg County and the City of Charlotte from 1740 to 1903, Volume II," by D.A. Tompkins, published in 1903. 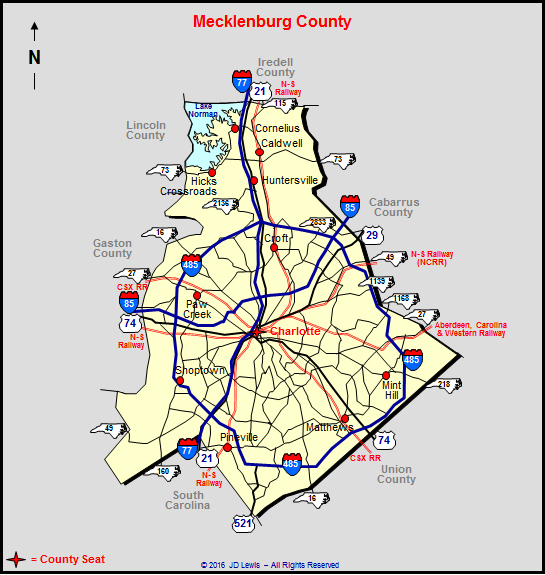 Click Here to view / download eight road maps of Mecklenburg County.